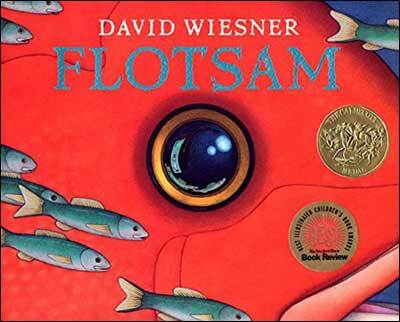 Flotsam is another visual extravaganza from one of our favorite illustrators, David Wiesner. In the story, a young boy at the beach stumbles upon a barnacle-encrusted box camera floating in the water. Intrigued, he runs to a local store to get the film processed, but he's totally unprepared for the mysterious photographs that he gets back---images of an advanced underwater world. The use of varying perspectives and layouts makes it even more exciting. Read it for fun, or as a fun intro to the mysterious, largely unexplored ocean depths! School Library Journal called it "a mind-bending journey of imagination" and they weren't kidding. In vintage Wiesner fashion, the story is intriguingly open-ended and wildly imaginative. Even readers familiar with Wiesner's trademark visual feasts will be awed by these spellbinding watercolor paintings. And if you don't yet know about this fantastic illustrator, we guarantee you'll want to know more after reading this book! This page shows some of the fantastic, imaginative illustrations inside this unforgettable book. The first illustration below (of the crab) takes place at the beginning of the book, when a curious, science-minded young boy is examining the different sea creatures he finds at the beach. Below are more glimpses into the magical undersea world that the boy uncovers via the magical camera. (In fact, you can see the camera falling to the ocean floor in the bottom image.) These illustrations are fun to look at here, but they are truly captivating when viewed in actual size!